Stir Fried Salmon Quinoa, a deliciously nutty fried “rice” made with quinoa instead of rice and leftover grilled salmon, carrots, chives, and corn. When cooked, quinoa is similar to rice except that it is fluffier and has a nuttier and crunchier texture. It cooks pretty much the same way too and this can be done in the rice cooker. 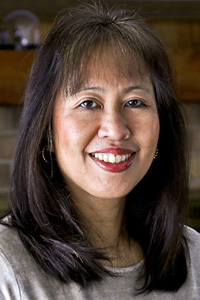 Like rice, it may be eaten plain with other dishes or used in pilafs and salads. Cooked quinoa can also be made into patties like this Spiced Quinoa Corn Patties. This brings us to the ever popular fried rice. Since fried rice is by far the most requested lunch at our house, it is inevitable that quinoa ends up like fried rice on our table. Both Ro-Taro (eldest son) and Ro-Jiro (second son) adore fried rice and never seem to tire of it. After Ro-Taro suggested Quinoa Chives Fish Cakes the previous week, Ro-Jiro came up with his own suggestion for this Stir Fried Salmon Quinoa. 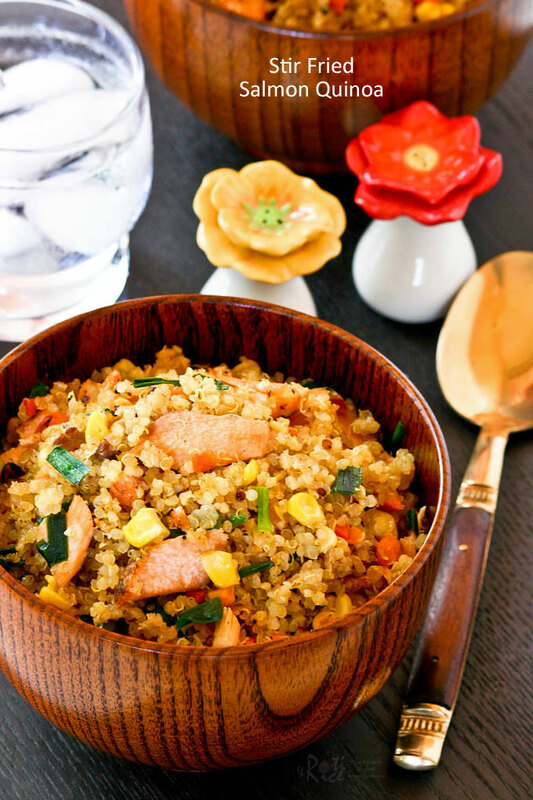 While fried rice is best done with cooked rice left overnight, stir fried quinoa can be successfully made with freshly cooked quinoa as it is naturally light and fluffy. Unlike freshly cooked rice, it will not clump together which is a real advantage when it comes to fried rice. Another plus is that quinoa turns deliciously nutty when fried. The idea of this dish is to use leftover grilled salmon but that is one thing I seldom if ever have in my fridge. I actually grilled a fresh piece of this Lemon Pepper Dill Salmon for today’s Stir Fried Salmon Quinoa. I used Chinese chives to give the dish a garlicky flavor. If it is not available, a good substitute would be finely sliced leeks. 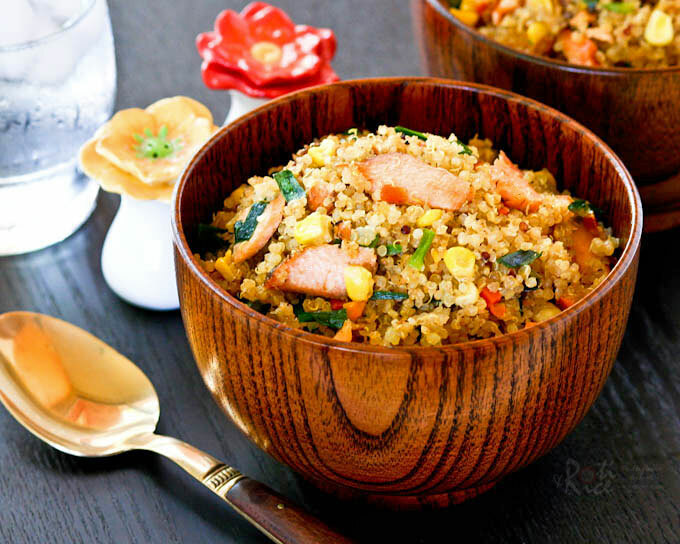 Stir Fried Salmon Quinoa, a deliciously nutty fried "rice" made with quinoa instead of rice and leftover grilled salmon, carrots, chives, and corn. Rinse quinoa until water runs clear. Drain and place in a medium sized pan. Add 2 cups (480ml) water. Place on the stove and bring water to a boil. Reduce heat and let quinoa simmer until all water is absorbed, about 15 minutes. Turn off heat. Fluff quinoa with a fork and allow it to cool completely. In a large non-stick fry pan, heat vegetable oil. Fry garlic for about a minute. Add carrots and corn. Fry for 2 to 3 minutes. Add salmon and chives and cook for another minute. Then add cooked quinoa. Stir to combine all ingredients. Add soy sauce, salt, and pepper. Stir to get everything well mixed and cook until quinoa is dry and fluffy. This will take 4 to 5 minutes. 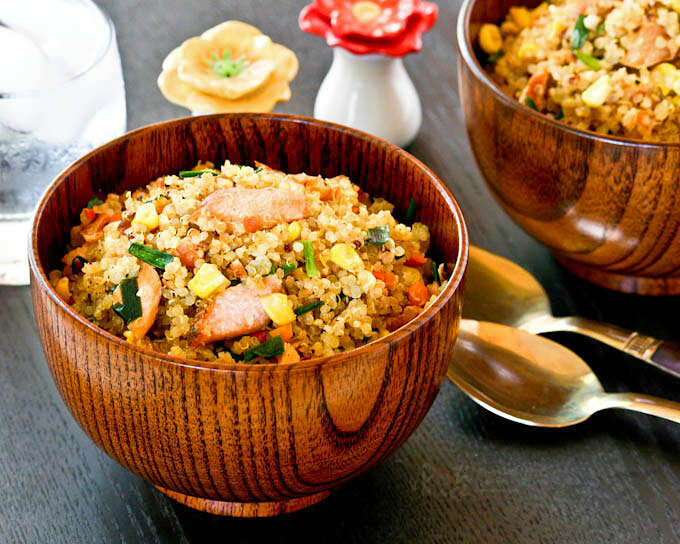 This deliciously nutty fried “rice” will definitely be repeated in my kitchen. I hope you enjoy it as much as we did. One of my fave replacements for rice! Quinoa is a good substitute for rice. It is light and fluffy. 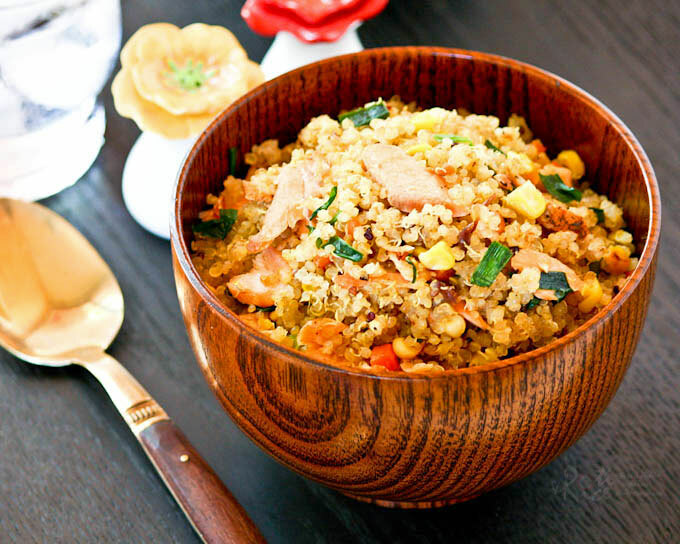 A great idea to make stir-fry with quinoa instead of rice. It looks mouthwatering with salmon. Thanks Angie! Fried quinoa is light and fluffy, a wonderful substitute for rice. Thank you for sharing this recipe! I tried it today and it’s taste awesome. Didn’t know quinoa tastes so good!